Little Falls NY is wedged between small mountains where the Erie Canal follows the gorge of the Mohawk River. The Happen Inn is a bar and restaurant located the basement of a corner building downtown, across the street from a clean and friendly Knights Inn, in which I stayed the second night of the trip. According the Wikipedia, Little Falls NY has a population of 5188. It feels bigger than that. Compared to the South, the architecture is very dense and urban. The towns seems somewhat prosperous. Even if this place is maybe no longer really an important town, it certainly still looks like it is. The crowd at the Happen Inn on a Friday night was full of people of all ages, but primarily in their twenties. For what seemed a rural area, the crowd was well dressed. The barmaid looked less than twenty-five, but worked with what seemed practiced efficiency. I did not stay late, but enjoyed mixing with people while I sat and ate at the bar. I tried to read my Harper’s magazine, but gave up and just watched the people, including the overweight woman with no teeth next to me, who was reading lottery sheets. There is lots of talk in upstate New York about the lottery. The food at the Happen Inn was sandwiches and appetizers, but well prepared with some low cholesterol options. The atmosphere felt almost sophisticated, until I heard the barmaid and a customer complain about the behavior of others at a recent tractor pull, which they both clearly had attended. She complained that people were throwing beer on her. There is never, she said, an excuse to throw beer on someone. 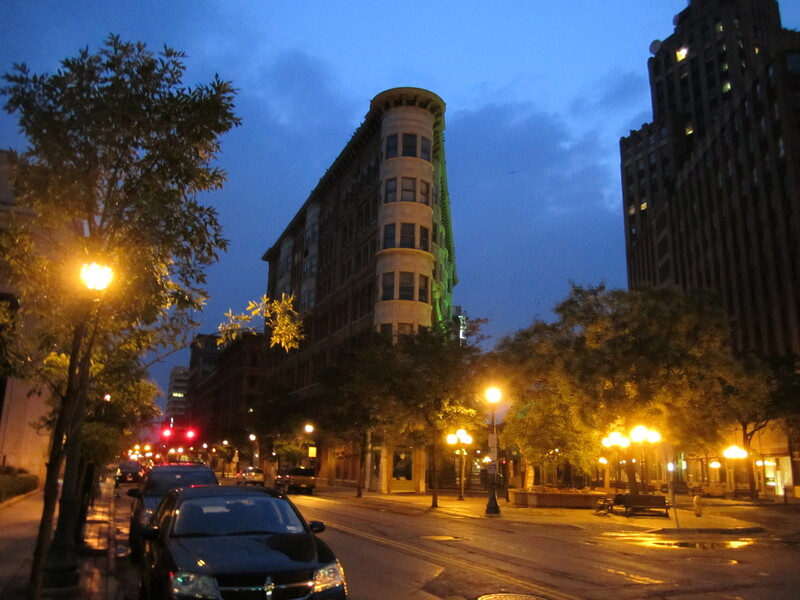 Unlike the dark basement feel of the Happen Inn, the Franklin Hotel is Rome NY is above ground and brightly lit. It is apparently no longer a hotel, but a popular small Italian restaurant. On this Saturday night, it looked like the interior of places we had known in New Orleans; formica tables without tablecloths, old guys (now including me) sitting at the bar eating fattening Italian food. On the iceberg lettuce salad that came with the pasta and chicken entree, there was a memorable vinagrette dressing. This place shows that no matter depressing Rome NY seems, if you look hard enough you can find a soulful place. 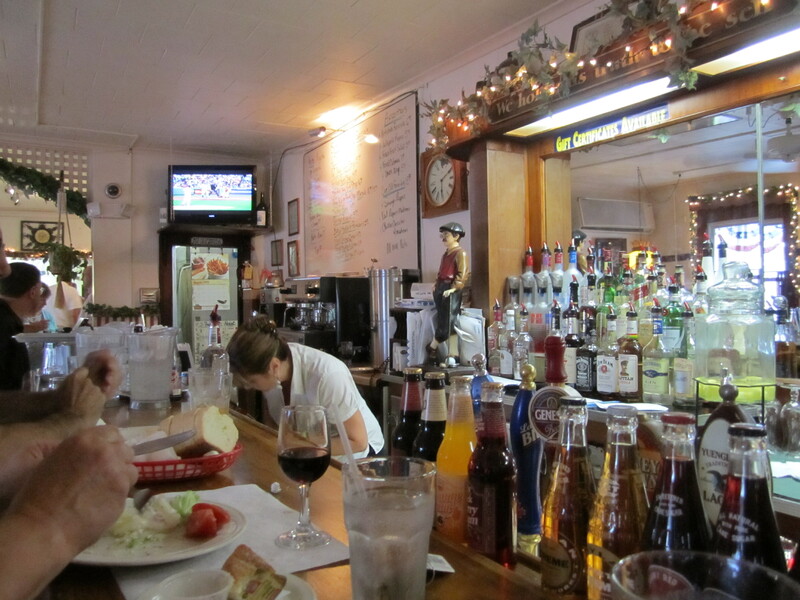 The French bistro in Syracuse was a late choice, and I ended up there as most diners were finishing up. I had walked too much around downtown and had a beer a nice brewpub in an industrial setting. I still did not feel comfortable with the brewpub menu. I ended up at the bar of this bistro, eating moule mariniere as I was given free and close range to watch Pulp Fiction on the bar TV. 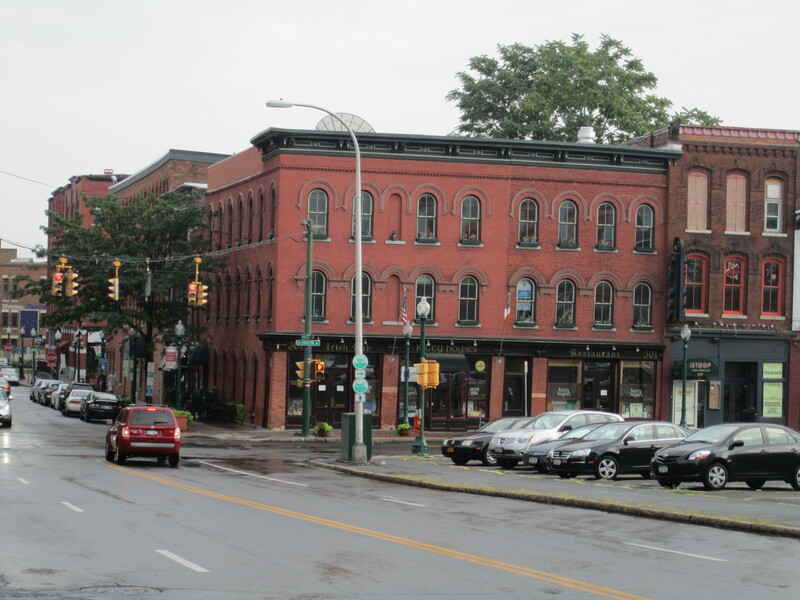 It is one hundred sixty miles from the Renssallear train station, across the river from Albany, to the Syracuse Amtrak station. This path continues further another one hundred seventy miles past Syracuse to Buffalo and Niagara Falls. This trip, even though I took THREE whole days off work, only included the section from Albany to Syracuse. There is a bike trail, or bike path, or bike route, or bike whatever, pretty much the whole way. My theory is that this all paid for by the governmental overseer of the former Erie Canal; the New York State Canal System. This Canal System really did put some money in this thing;. However, over four days I saw almost no long distance riders. I did see a large number of local joggers, cyclists, and walkers, however, usually within a quarter mile of parking lots to the trail. Except for one Lowes near Amsterdam, in three days I did not see any large chain stores, much less a Wal Mart. People in upstate New York actually appreciate summer. They come out to the bike path, the street, the park, thrilled not be shut up inside. In North Carolina, people sit inside in the summer, hiding from the oppressive humid steambath. In Albany, the crowds come outside, basking in the heat and sun. On my arrival afternoon in Albany, there was an outdoor concert on the Riverfront and the locals were out in force. After leaving the concert riding towards Cohoes and then Schenectady, one can feel the greenness envelope you, despite the roar of the New York State Thruway. Wild flowers seem much more vivid. Because summers are so brief, plant life seems rich and sweet and short. 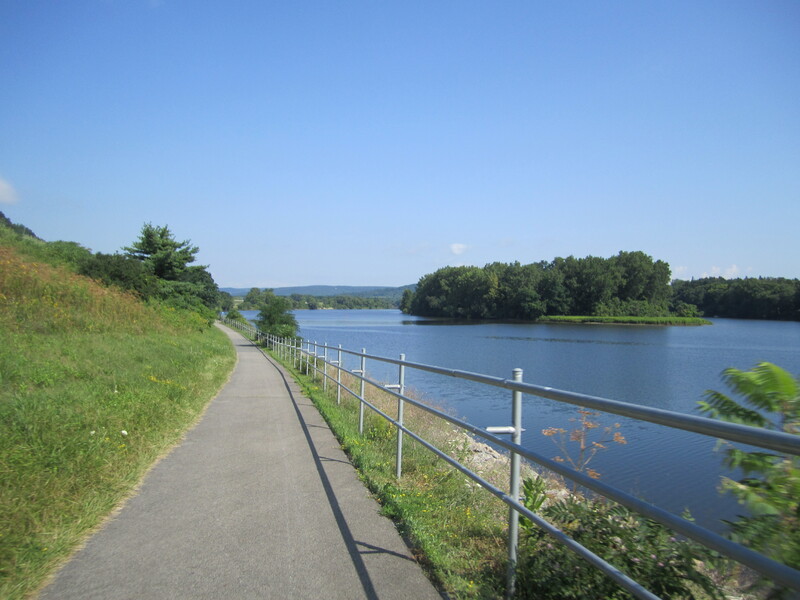 After Albany to Schenectady on an old rail line and through residential streets, the path continues along the Mohawk river. In many places, the paved bike path runs right next to the river. Contrary to what you might think, this bike path is, in most places, NOT the tow path to the Erie Canal. The Erie Canal has changed its course several times in almost two hundred years. After Amsterdam and Utica, the Mohawk River cuts through the mountains. The bike path is mostly on a former rail line on the south side of the river. On the north side is the CSX rail line, the former New York Central “four line main line” through New York State. In this same valley, the New York State Thruway has to fit, along the road built before it. So these four routes have to thread through the mountains, crossing and criss-crossing each other. After Utica, the terrain flattens out. Much of the distance from Utica to Rome to Syracuse is swamp, flat areas along a brilliantly green canal. Crossing from Renssalear into Albany, you can see what Betsy calls Rockefeller’s erection; four high rises of Empire State Plaza, built in the 1960’s, along with the the fort-four story tall Corning Tower and The Egg; an auditorium. The whole idea was to project something like Niemeyer’s Brasilia over an existing three hundred year old city. If only America now could be so ambitious. I guess. 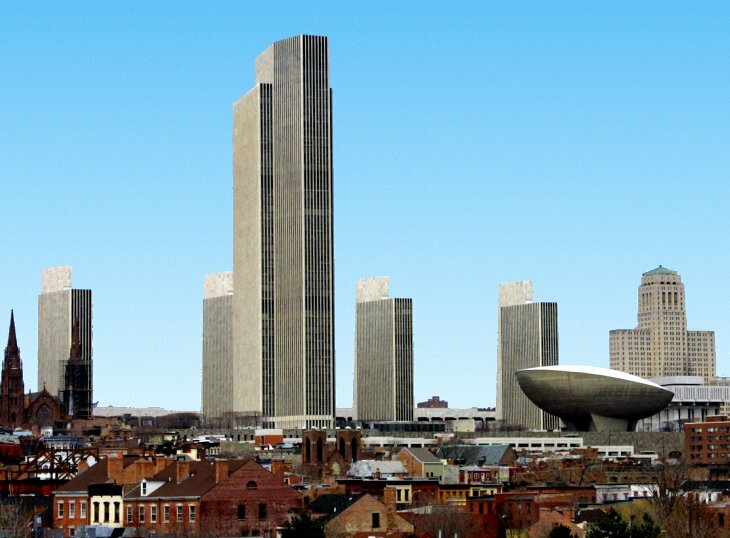 Albany and Schenectady, compared to cities later in the trip, do not seem so depressed. I guess that is due to government spending. Spending the night in downtown Schenectady, it seemed to be coming back alive despite General Electric layoffs. Betsy says that General Electric “declared war” on Schenectady some thirty years ago, reducing the number of employees in Schenectady from about sixty thousand to about fifteen hundred., even while this giant corporation had been very profitable. 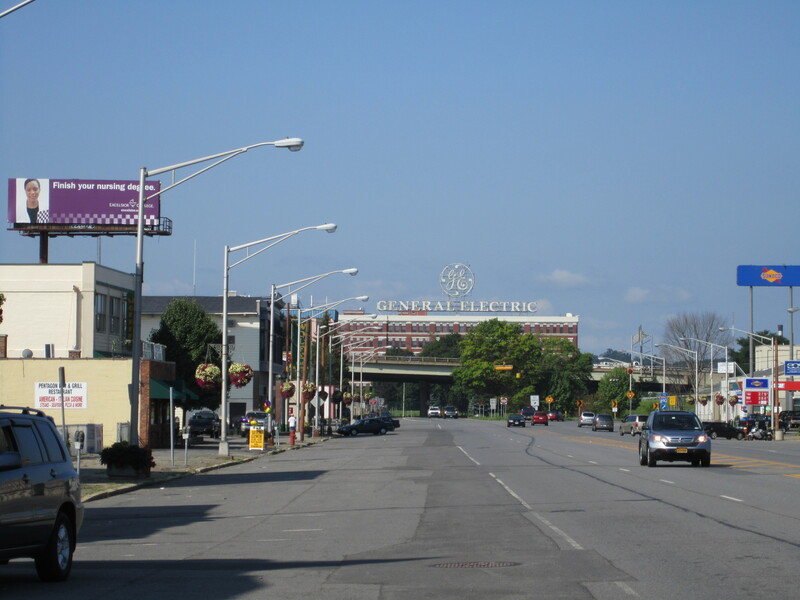 Schenectady was the first of several cities that had an “Erie Blvd”, which was the former Erie Canal turned into an unattractive downtown highway. I love cities. I love Detroit and Cleveland and Portsmouth Virginia. Despite this, I find Rome and Amsterdam depressing. They do not even fit the bill of the dead mill town, with a dense downtown full of abandoned buildings. From redevelopment efforts some years back, they have widened downtown streets reminiscent of Durham’s Downtown Loop. Amsterdam seems torn apart, disconnected, with falling down buildings scattered next to a highway. 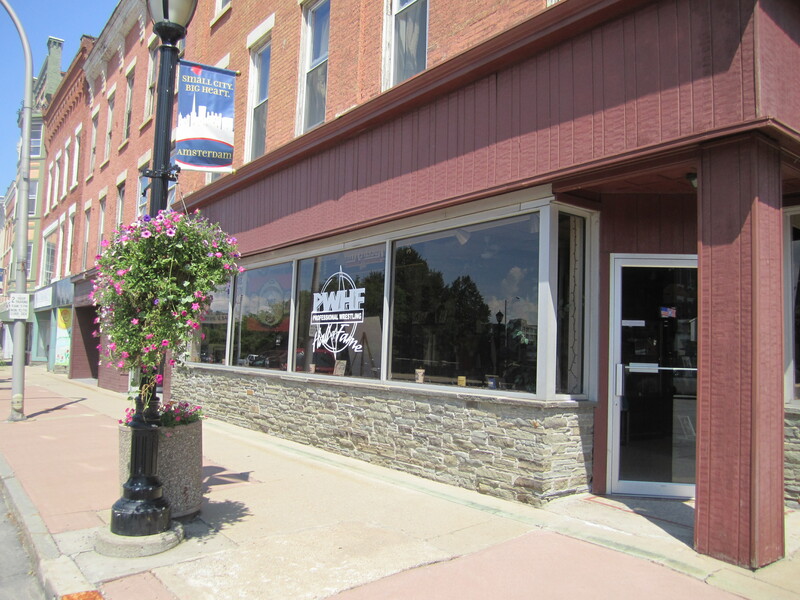 It does have a Professional Wrestling Hall of Fame in a downtown storefront. 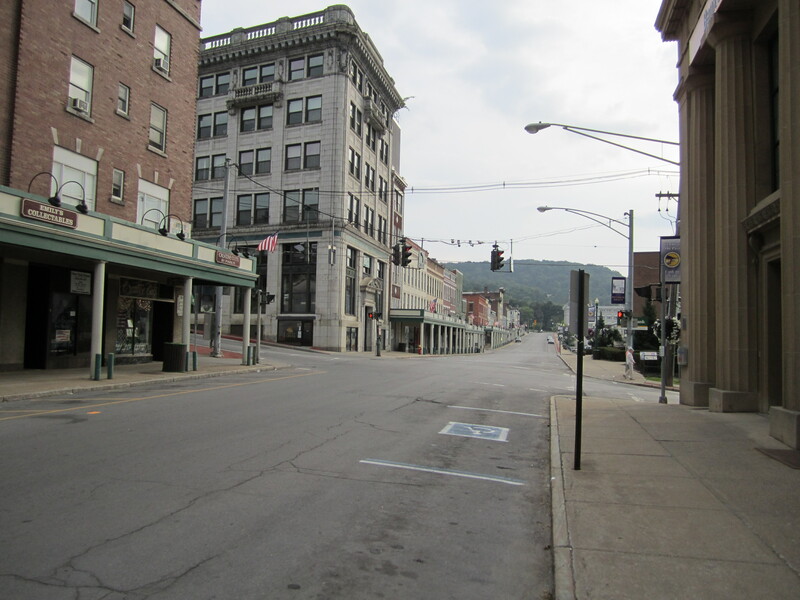 Rome NY reminds me of Portsmouth VA without the waterfront, black people, or acceptable weather. The downtown has been replaced by a half dead strip mall. I woke up Sunday morning to a gray mist outside of my motel window, which looked out over the downtown highway. It was strangely mesmerizing to watch the cars go by in the rain. 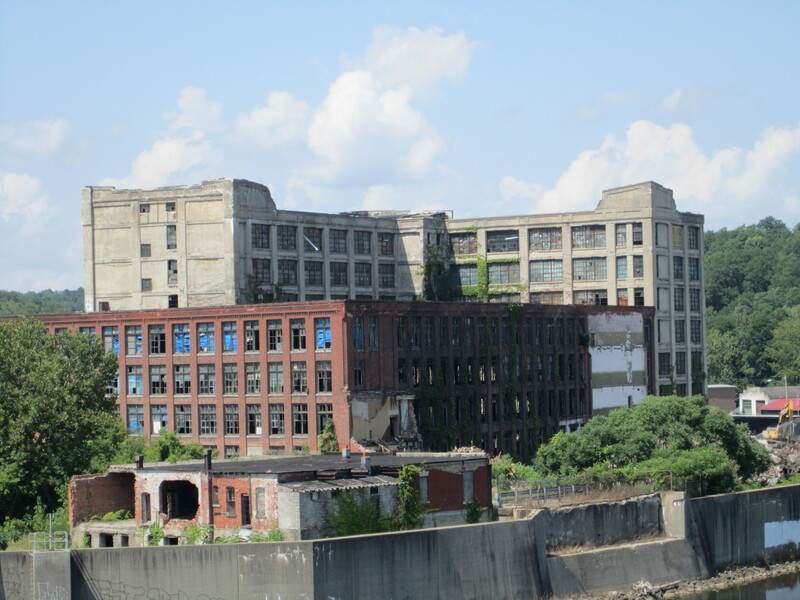 Utica is physically reasonably intact, with a long line of empty brick factory buildings, but depressing just the same. I had a late Sunday breakfast in a diner there. Everyone in this place looked old, poor, disabled, or all three. An old guy behind the counter was drying the silverware with a dirty dish towel, explaining that the dishwasher was broken. Syracuse is a mixed bag. It is larger than the aforementioned places, and has certain areas that are intact and lively. It has a huge stock of early twentieth century industrial buildings. Certain suburbs like Fayetteville look prosperous, almost rich. As you are riding through Syracuse suburbs through properous strip malls, the prosperity stops exactly at the city limits. The summary judgement of this, and of the whole trip, is that America in in decline. But I had a great time looking at it all.